During the run up to the Christmas festivities, we weren’t just helping people find job vacancies in Basingstoke. Oh, no ho ho! We donned our Father Christmas hats and delivered cake, biscuits and chocolates to all our wonderful clients to say thank you for their support throughout 2016. “That’s not exactly Christmas-spirited”, we might have heard you say. In pantomime style, we’d reply “Oh yes, it is”! Because, as we visited various businesses around Basingstoke, we collected much needed winter woollies and toiletries for The YOU Trust at May Place. The YOU Trust is a charity working in Hampshire and Dorset; providing flexible care, support and advice services for homeless and vulnerable people. Everyone we visited was incredibly generous, so we wanted to share some of the words of gratitude that the charity have since sent us. 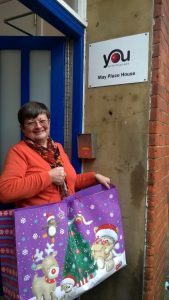 They wanted us all to know that the hats and scarves donated are helping to keep many homeless people warm during these colder months and that the chocolates were a wonderful treat over Christmas time. The YOU Trust asked the residents of May Place what they would like the money we’d collected spent on and they asked for some Christmas-themed DVDs, which they watched and enjoyed all over the holiday. May Place offers shelter and support for homeless people in Basingstoke throughout the year, including those on the streets and sofa surfing with friends and families. They have a designated outreach team who help them with applying for housing, benefits, and arranging hospital and doctor’s appointments. Along with the Camrose Centre at Glebe Hall in Basingstoke town centre, they also offer homeless people food in the evenings. Thanks to generous donations from the public, this winter The YOU Trust at May Place has also been able to hand out sleeping bags, thermos flasks, rucksacks, bed rolls and warm weather gear. However, we must remember that homelessness is never just a seasonal problem. It affects people in spring, summer and autumn, too. With that in mind, we would like to continue collecting useful items for May Place throughout 2017. So, next time we visit you to talk about jobs in Basingstoke, we will also be letting you know which items we are looking for. Please continue to donate whatever you can – it really is appreciated. Are you a business with job vacancies in Basingstoke? Get in touch with us and let’s see how we can work together.